Control him if you can! 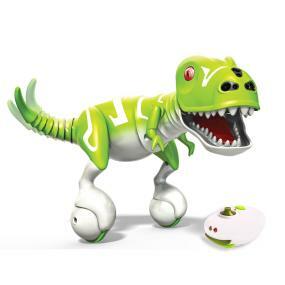 Boomer is the incredible Zoomer Dino that only you can tame! He can sense where you are and what you're doing! Using True Balance Technology(TM), Boomer perfectly balances while roaming freely around your home! 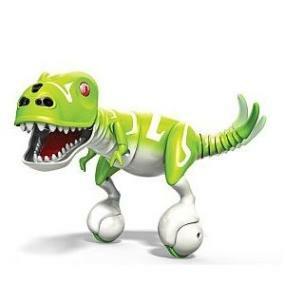 Boomer’s the interactive dinosaur who just loves to play. 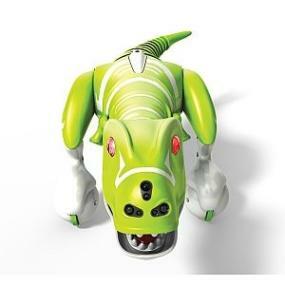 With real dinosaur movements, sounds, and dino-sense responsiveness, Boomer can detect when you’re interacting with him. He will react to being stroked and touched. Control him if you can! Just like a real dinosaur, Boomer can get angry, spin around, chomp his massive reptile jaws, and roar. Your prehistoric pal responds to motion so use your hands to tame his Dino nature and build your friendship an make him your loyal pet. Make him perform tricks or follow you around. You can train Boomer to dance, chase, chomp, and roar. Boomer even comes with a remote handset if you prefer complete control. His eyes change colour with his mood, indicating if he's happy or mad, so make sure you give him all the attention he needs. They will turn blue when he senses your hand, turn purple while he’s being trained and go red when he’s mad. Pat him on the nose and Boomer’s eyes will turn green, which means he’s very happy. However, if you pull his tail, Boomer will let you know he's angry. His eyes will turn red eyes and he will go on a dino rampage! Using True Balance Technology, Boomer perfectly balances while exploring your home on two wheels. He can spin in circles, move forward and backward.